The asking price for Rick Nash was presumed to include a first-round pick and a quality prospect. That price was met on Feb. 25—just one day shy of the deadline—when the New York Rangers sent him to the Boston Bruins. In the deal, the Rangers acquired Boston’s 2018 first-round draft selection, defensive prospect and possible future Rangers captain, Ryan Lindgren. To the surprise of many, the deal included more. In exchange for taking on the remainder of Matt Beleskey’s contract (that the Bruins retained 50% on), the Rangers inexplicably also managed to acquire Ryan Spooner – a player who could be flipped for additional assets at the 2018 draft or become a staple in their quest to become contenders again. Seemingly a throw-in, the 26-year-old Ottawa native quickly made the Bs look foolish for giving him away for so little. Not only did he register two assists in a losing overtime effort against the Detroit Red Wings the same night he was traded, but he went on to score six assists and seven points in his first five games as a Blueshirt. Operating at an astounding 1.40 points per game (P/GP), he’s been a revelation for the Rangers and their post-deadline skeleton crew. If this was all that was known of Spooner, the sample size would be too small to make any kind of meaningful determination on his value, especially given the poor state of the Rangers thanks to the additional deals made in conjunction with the Nash trade that sent Ryan McDonagh and others packing. Luckily for Rangers general manager Jeff Gorton, with 253 games played over six seasons in Boston, there’s a much clearer picture to illustrate how reliable Spooner could be if he is retained by the Rangers. 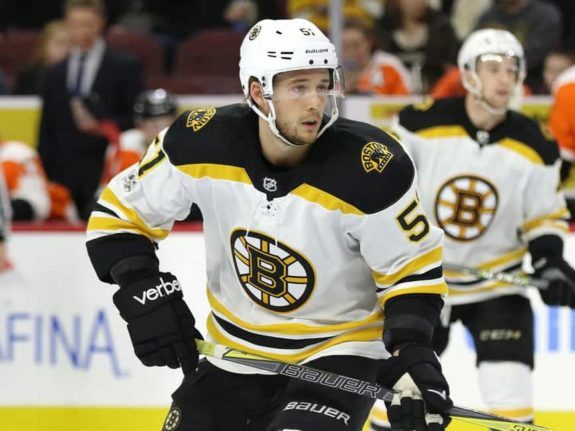 Selected 45th overall by the Bruins in the second round of the 2010 draft, Spooner was something of a late bloomer, not joining the Bs in a full-time capacity until the 2015-16 season. Since then, his year-to-year growth paints the picture of a player worth investing in. Notably, his P/GP average has shown the kind of gradual improvement general managers crave. Since that 2015-16 season in which he posted 0.61 P/GP, his average dipped the following year in 2016-17 to 0.50 but bounced back in his final year in Boston to a 0.64 pace. That’s effectively a three year aggregate of 0.58 P/GP, equal to roughly 48 points over an 82-game season. Those are solid numbers for a quality third- or potentially second-line player. From an analytics perspective, he’s no slouch. Using the 2015-16 season as an entry point, he’s averaged a 51.6 Corsi for percentage and 51% Fenwick for at even strength. However, it’s important to note that he accomplished this playing some of the most sheltered minutes in the league over that span, averaging an aggregate 65% offensive zone start percentage (oZS) to 35% defensive zone start percentage (dZS). Oddly enough, he’s been deployed in a near mirror flip with the Rangers, playing with a 38.6 oZS% to 61.7 dZS% differential while averaging an astounding 1.4 P/GP through his first five games. Spooner is a highly creative playmaker and also a multi-positional forward, having shown an adept ability to play his natural center position or shift to either wing with few side effects. That kind of roster versatility is invaluable in today’s NHL. While his early play in New York has been invigorating, there is an important wrinkle to all of this that could push Gorton toward liquidating Spooner at the upcoming draft for even more future assets to benefit his rebuilding club: arbitration, and it can be a nasty business. There’s no guarantee the Rangers would take him to a scheduled hearing, as these cases tend to resolve themselves before that becomes necessary, but it’s still a risk Gorton will need to account for. Spooner isn’t just arbitration eligible, either. He is also one year away from Unrestricted Free Agency (UFA), which could force any contract negotiations beyond a one-year extension into uncomfortable territory depending on Spooner’s asking price. It’s not inconceivable that he’d be looking for a multiple year extension worth something in the range of $3.5 million to $4.25 million in annual average value (AAV). Comparable players like Calgary Flames center Mikael Backlund (three years, $3.575 million AAV) and St. Louis Blues center Patrik Berglund (three years, $3.7 million AAV) both signed multiple year extensions at the same point in their careers; inking new deals at the age of 26, arbitration eligible, and with UFA status looming. It’s possible Spooner’s agent could look to a pair of centers playing for the Nashville Predators as comparables, like Colin Wilson (four years, $3.937 million AAV) and Craig Smith (five years, $4.25 million AAV). Both signed their extensions at the age of 25, so they’re not directly analogous but could help in establishing a salary ceiling. Whether Gorton opts to keep him around a while longer or not, Spooner has proven his worth. He may have taken a longer road to the NHL than the Bs had hoped, but they erred in giving him away so frivolously. 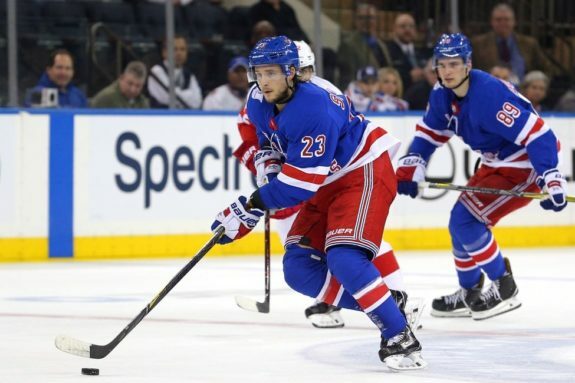 Gorton now has 14 games left to help determine whether Spooner is a long-term fit for the new-look Rangers, or if a draft day deal would be more beneficial to his club going forward. No matter the answer, Spooner’s already won.